Earthly Body 3-in-1 Heart Shaped Truth Or Dare Valentine's 2016 edition. Natural body care from California. 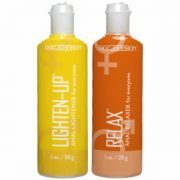 The 3 in 1 massage candles melt down into a massage oil with a unique blend of six natural oils providing a professional slip that moisturizes skin, leaving it appear more healthy and hydrated with a youthful looking glow. 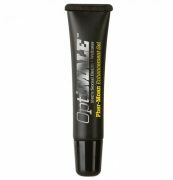 Experience this liquid gold by pouring it directly onto the body for a warm massage, or in place of your daily moisturizer! Specially formulated to melt at just three degrees above body temperature, 3 in 1 massage candles do not just provide romantic light and fragrance the melted wax can also be used as a moisturizer or warm massage oil. 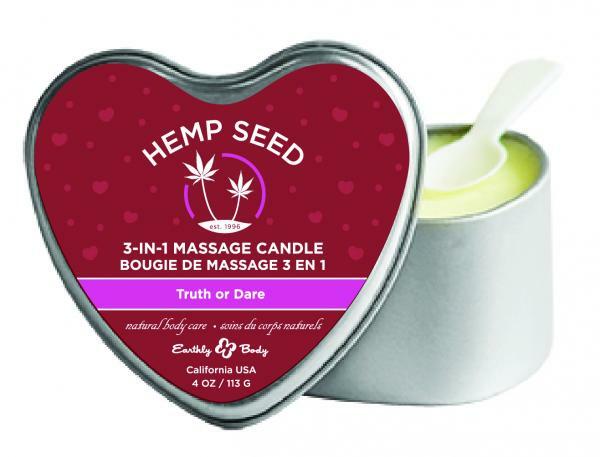 Hemp seed oil, the primary ingredient in these candles, has a fantastic slip factor for massage and, because it penetrates to the lipid layer of the cells, skin is left soft and moisturized, not greasy or gooey. The unique combination of oils in these candles also increases their burn time. Soy oil burns cleaner and longer than paraffin, so these candles will burn for up to 60 hours, depending on how much melted wax you dribble out for other endeavors: wink, wink. Put an unlit candle, with the lid off, in a dresser drawer to infuse lingerie with sensual fragrance. Freshen the air even when you are not burning the candle. Simply leave the lid off to make a whole room smell great! Made in the USA. 4 ounces.